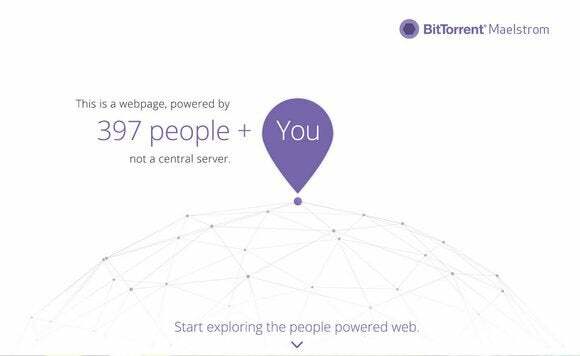 BitTorrent recently announced Project Maelstrom, a plan to deliver web pages via peer-to-peer torrent technology using a special web browser—a drastically different method than the traditional server-to-client system powering most of the web. Yet BitTorrent's announcement raised more questions than it answered, and we wanted to know what this thing was all about. After an email exchange with BitTorrent's communications chief Christian Averill and product manager Rob Velasquez we have some more answers about Project Maelstrom. Does it work with the regular web? What is the Maelstrom browser based on? Will ads work? What about interactive web sites? Read on to find out. Can Maelstrom convert current web sites into torrent sites? No. While Maelstrom can read websites delivered in torrent form, it cannot convert an existing website. "In order for publishers and developers to take advantage of this, they have to publish their content as a torrent," says Averill. How will Maelstrom deal with hackers tampering with content? We didn't ask BitTorrent specifically about this, but torrents use cryptographic hashing to verify you are downloading the correct files. Presumably, Maelstrom will verify hashes automatically the way torrent apps do now. That won't prevent a bad actor from creating a distributed site with malware included, however. Can the Maelstrom browser also access regular websites as well as ones served via torrents? Yes. "We support normal web browsing via HTTP/S. We only add the additional support of being able to browse the distributed web via torrents," Velasquez said. If sites are being distributed via torrents and then shared among other users, won't that lead to larger and larger browser cache folders? BitTorrent has thought about this issue and you'll be able to limit the size of your cache at your discretion. BitTorrent wil have a recommended setting, and Averill says that the cache size shouldn't make a noticeable impact on your hard drive. Is the Maelstrom browser based on a current open source browser project like Chromium, Firefox, or Webkit? Yep. Maelstrom is based on Chromium, the same open-source project found underneath both Chrome and Opera. Can Maelstrom work with common web applications such as storefronts and productivity apps like Google Docs? Yes, Velasquez told us. "HTTP requests can be made inside of a torrents and BitTorrent requests can be made inside of normal HTTP/S websites," he said. "In this way, it’s possible that we could see a lot of intermingling of the two types of content. Maybe a HTTP/S served blog chooses to serve images or videos via a torrent and display them inline or maybe a torrent website chooses to embed live tweets via an HTTP/S API." What about video...is streaming possible? "We handle all files the same when they’re requested from a torrent," Velasquez said. "So you could embed a video from a torrent inside of another site and it would be streamed from the source just as you could embed images that are located inside of a torrent." Can a Maelstrom site serve advertising? You bet. Maelstrom handles ads in the same way that normal websites do. "You can embed anything in a torrent website that you could embed in a http-served website, like Google Analytics, Facebook like buttons, etc," Averill said. That's about all the answers we have for you right now. Maelstrom is sounding like a very interesting idea. We're looking forward to trying it out.